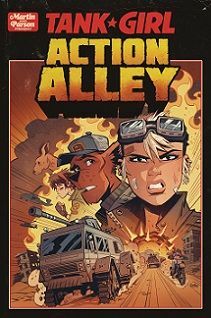 Comments: Tank Girl, Jet Girl, Sub Girl, Barney and Booga are the main cast of this comic. These characters are beyond weird. Just seeing them hanging out doing ordinary things it is easy to see no way are they ordinary. The Tankmaster vehicle is an amazing thing that you know Tank Girl is going to have fun with. They are going on Holiday. Booga the kangaroo guy gets a pet kangaroo which he tries to keep hidden. Hiding a kangaroo is not easy. Dobson is along for the ride to. He is like an inventive genius. Tank Girl and her friends are like no one else you will laugh at their antics and wonder at the unrealistic things around them. These friends are awesome and as you follow their adventures you will realize that you to are awesome. Tank Girl is no model citizen, she breaks the rules and them some. Yet there is no way you can not love this girl plus of course she has a tank.